Character Galore & updates you will appreciate await you at 329 Milltown Blvd. This lovingly maintained Turn Of The Century Home boasts a large sunrm that is perfectly positioned between the attached garage & the spacious kitchen. A full bath/laundry rm is very convenient & the dining rm is large enough for those family get togethers! Newer windows provide an abundance of light & warmth from the sun & the living rm is perfect for your over-sized furniture. Currently, the main floor master bedrm is a wonderful feature but could be easily converted into a large family rm, home office or gym area..the possibilities are endless! Upstairs features 2 bedrms, a full bath & a partially finished attic space that would make the perfect master suite, studio or kids play area. 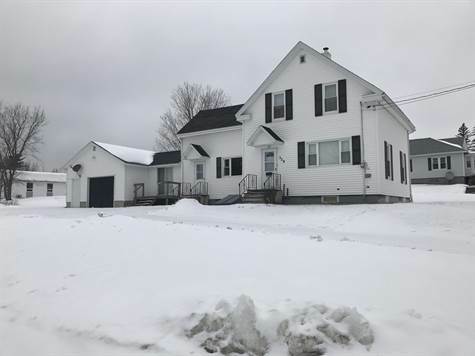 Many upgrades have been completed such as new asphalt shingles, newer windows & vinyl siding making this priced to sell home a “must see” for the smart buyer looking for a beautiful home within walking distance to everything downtown St Stephen has to offer! Book your private showing today! Please note: This is an Estate Sale & is being sold “As Is Where Is”.